Have we mentioned this is a pretty big phone? Samsung's Galaxy range must now officially cover every single corner of the smartphone and tablet market. With the tiny and purse friendly Samsung Galaxy Fame right through to the Samsung Galaxy Note 10.1 via the Galaxy S4 Mini, Galaxy S4, Galaxy Note 2 and Galaxy Note 8.0 tablet. The Samsung Galaxy Mega needs to push itself into that line-up somewhere, and the name gives a little clue as to where it sits. We questioned the original phablet, the Samsung Galaxy Note, over its 5.3-inch screen size, and the Note 2 just pushed that further to 5.5 inches whilst remaining incredibly popular. At 6.3 inches, we are again left questioning just how far the Koreans can push smartphones before it borders on the ridiculous. First impressions of the Galaxy Mega do suggest that Samsung might well have found that border. Hitting price tags of free on a two-year £33pm contract, or £490 (around $800/AU$880) SIM-free means that the Galaxy Mega looks to fight it out against the big boys, if you'll forgive the size pun. 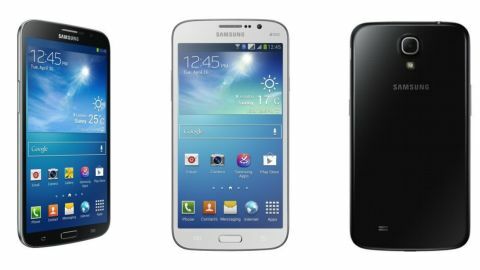 The five-star-rated HTC One, the Sony Xperia Z and Samsung Galaxy S4 all square off at these price points, so the Galaxy Mega has a fight on its hands. The Galaxy Mega will also have to fight to gain custom from potential Galaxy Note 2 customers, as well as from the upcoming Xperia Z Ultra and Galaxy Note 3. In order to stand any chances of winning this fight, the Galaxy Mega is going to need to bring something pretty special, other than just a massive screen. That screen is also going to need to be impressive, thankfully this is an area that Samsung is famed for. The 6.3-inch 1280x720 'Super Clear LCD' does a very good job, although we can't say we wouldn't have preferred a Full HD Super AMOLED Plus screen, especially given the Mega's price tag. Behind *that* screen, the rest of the specifications leave a little to be desired, if only because they aren't as impressive at the first look. If a 1.7GHz dual-core processor and 1.5GB RAM seem familiar, that is because they match the lower priced, smaller Galaxy S4 Mini. Even the 1.9MP front and 8MP rear camera sensors, and 8GB internal storage are drawn from the S4 Mini. The Galaxy S4 Mini is also around £7pm cheaper on 2 year contracts, so it really does start to appear that you are paying for the size. The Galaxy Mega does come with all the other features that you would expect from the modern mid to high end smartphone, with Wi-Fi, Bluetooth 4.0, NFC, 4G and Android 4.2 to keep things running. There is also the Infra-Red blaster that seems to be making appearances across a variety of smartphones. This is all packaged into a frame that measures 167.6 x 88 x 8mm, and weighs in at 199g. The Galaxy Mega unsurprisingly then, sits a little awkwardly in one hand, although the narrow depth and lighter weight make it a lot easier than we first expected. The Galaxy Mega even sits rather comfortably in the pocket, providing you're not wearing anything that fits a little tight. Design wise, the Mega sits well within the existing Galaxy range, with the thinner bezel and curved edges giving it a clean look, and Samsung's standard button lay out giving an air of familiarity. The false chrome plastic wrapping also helps to make the Galaxy Mega feel more premium, although the plastic chassis suffers from the familiar problem of feeling a little cheaper than all metal devices like the HTC One. Hidden behind the removable (and fairly flimsy feeling) back cover sits a 3200mAh battery to keep the Galaxy Mega running. The microSIM and microSD slots are also located behind the cover, and we didn't have the same trouble putting them in that we did with the Galaxy S4 Mini. The microSD slot is somewhat necessary on the Samsung Galaxy Mega, with only around 5GB of the 8GB storage free. For a smartphone that has clearly been designed around media consumption, this is a bit of a surprise. Camera wise, we've already mentioned that the Galaxy Mega comes with a 1.9MP sensor on the front, providing clear imagery for those selfies and Skype calls, and an 8MP rear sensor for all your other snaps. The 8MP sensor might seem a little small, although Samsung has a habit of making every megapixel count, with the identical sensor on the Galaxy S4 Mini providing some more than decent shots. Thankfully, there is also a flash, albeit a single LED. The menu and return soft-keys sit either side of the physical home button, with the volume rocker sat on the left edge, with the power/lock button sat directly opposite on the left. Both sets of buttons were easy enough to hit one handed, a plus for a device of this size. The top edge houses the 3.5mm headphone port and IR blaster, with the micro-USB port (that doubles up as an 11pin MHL port) at the base. Overall, the Samsung Galaxy Mega doesn't feel as large as it could, but the 6.3-inch screen is always going to be divisive. With the price range pushing the Galaxy Mega up against the flagships, we can see it struggling a little, and with the Galaxy Note 3, HTC One Max and Sony Xperia Z Ultra for company the phablet market is getting a little congested.